Restless and sleepless nights can be painful regardless of the underlying cause. Has night been so long for that you wished someone would come, give you a warm hug and cuddle you to sleep? If so, accept our utmost felt sympathy. But we are willing to do more. In this review article, we will show you how YnM Weighted Blanket can help you sleep better throughout the night. 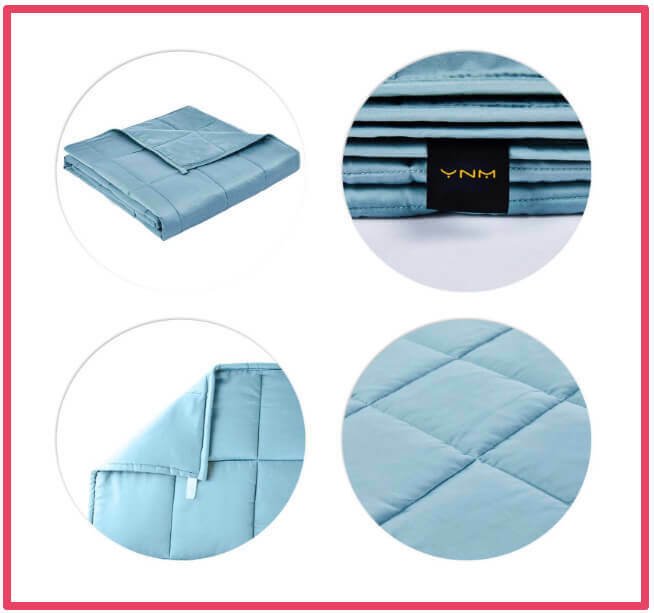 YnM is a leading company in producing good quality weighted blankets and duvets for export. Their blankets are among the best, yet they are still more affordable than other models like Dr. Harts, Quility and Gravity blanket. But what makes these blankets so special? 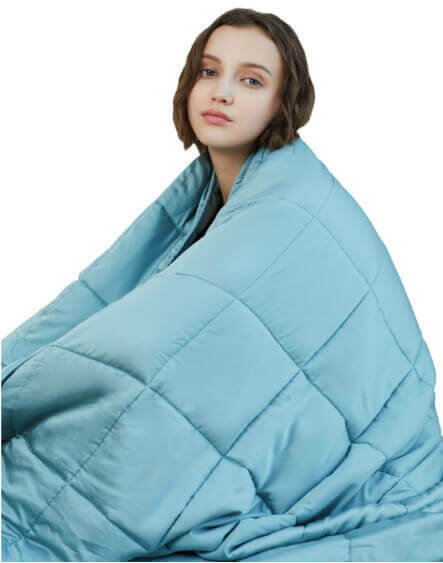 YnM is top-grade weighted blanket designed using high-end technology to provide you with the ultimate warm and relaxation every time you wrap yourself with it. Research indicates that these kinds of blankets relax your entire body by stimulating feelings identical to being hugged or held. The resultant feeling will make you sleep more quickly and enjoy a more in-depth, uninterrupted sleep all through the night. However, you don’t just need a good quality weighted blanket at night; you’ll find even more relaxing during the day. This is the case if you usually struggle with anxiety, stress, chronic pains, restless leg syndrome PTSD, and insomnia. It also has an excellent calming effect on children with autism and Attention Deficit/Hyperactivity Disorder (ADHD). You will read many YnM weighted blanket reviews, but very few would tell you the science behind their calming and relaxing effects. It uses what experts call deep touch stimulation (DTS). But what is DTS? We can only define it as a firm touch but with a gentle squeezing, holding and hug capable of relaxing the nervous system. Doing it appropriately triggers a series of physiological reactions in your body that stimulates a general feeling of peace and calmness. The reason you find it difficult to fall asleep and sleep soundly throughout the night is that your body is in the state of fight and flight (sympathetic nervous system). The deep touch therapy switches your body from this state to that of rest and digest (parasympathetic nervous system). attention, impulse control, motivation, memory, and digestion in people using the therapy. Forgive us if that was too much science for you. However, you need to appreciate what level of research has gone into the production of YnM. We believe you also understand why this type of blanket is excellent if you are struggling with the conditions we mentioned earlier. Many features set this heavy blanket apart from its competitors. Despite being high-quality, YnM is one of the most affordable weighted blankets you can ever find in the market. This is amazing given the fact that other brands that are comparable in terms of popularity and quality cost hundreds of dollars. Like other top quality weighted blankets, this unit features seven-layer design to perfectly surround your body as you sleep or relax to provide you with heightened levels of comfort and temperature regulation. YnM used all-natural 100 percent breathable cotton on the outer cover that contacts your body. The cotton is nontoxic, odorless and hypoallergenic. You don’t have to worry if you are hypersensitive to environmental allergens or you have sensitive skin. The cover won’t trigger any adverse reaction. The layer right after the exterior cotton is another breathable and lightweight fabric. It covers glass beads on both sides to ensure the blanket provides users with maximum comfort. Another beautiful thing about the inner layers of the blanket is the weighting material. Typical heavy blankets use silica sand or more commonly polly pellets which are noisy and do not allow the blanket to fold well. YnM uses millions of tiny glass beads that are sewn between two layers of lightweight fiberfill. The sewing technology used is so advanced that you don’t have to worry about the glass beads leaking. The beads are sewn in each compartment to ensure they are quiet and stay in place as you sleep. The makers of this fantastic blanket included more glass beads and fewer fillers in the design to improve temperature control while at the same time ensuring you experience soft, comfortable blanket with uniformly distributed weight. One of the things we realized from the various customer reviews we have read on Amazon is that people love the customizable duvet cover that the brand offers. Such minky covers come in varieties for you to choose what matches your decor and needs. The prime choices are breathable cotton duvets, ultra soft and warm (minky) duvets, and cooling bamboo duvets. All these offer your weighted blank protection, allow you to use the blanket in different weather conditions and most critically reduce the frequency of cleaning and challenges associated with such exercise. We all have different tastes and preferences. YnM knows this, and so they provide duvet covers of different colors. You can check the options on Amazon to see the many options you have. The inner blanket is available in only three colors – grey, navy and dark grey. The YnM weighted blanket is available in multiple size and weights. However, you need to exercise caution while dealing with bedclothes that are as heavy as this kind of blanket. The heavyweight can take a toll on you. It is therefore important that you choose the right blanket size (and weight) before you make an order. You can use a simple calculation to get the ideal weight for you. Multiply your body weight with 0.10 and then add one pound. That’s 0.10 (body weight) + 1 lb = the ideal weight for you. For instance, if you weigh 160lbs, the ideal weight of YnM weighted blanket for you is 17lbs. Nonetheless, you do not have to worry about math because there is a chart to help you with decision making. The different blankets that YnM offer range in weight from 5 pounds (for a 40-pound child) to 25 pounds (for a 240-pound adult). 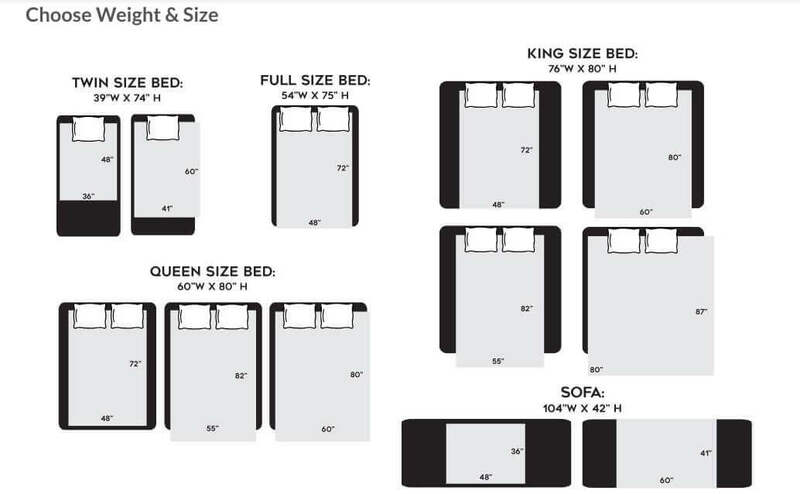 When it comes to size, there are blankets for twin size beds, full-size beds, king size beds, and queen size beds. Weighted blankets are meant to be heavy to deliver the kind of results expected from them. They also need to be breathable and soft with the ability to offer excellent temperature control. 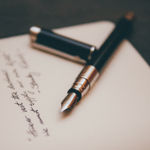 YnM has all these features and more, but there are a few things to keep in mind to get the most out it. If you are taller than 5ft 5in in height, choose the longest coverage (more than 80 inches), or you’ll leave out your legs to kiss the cold. 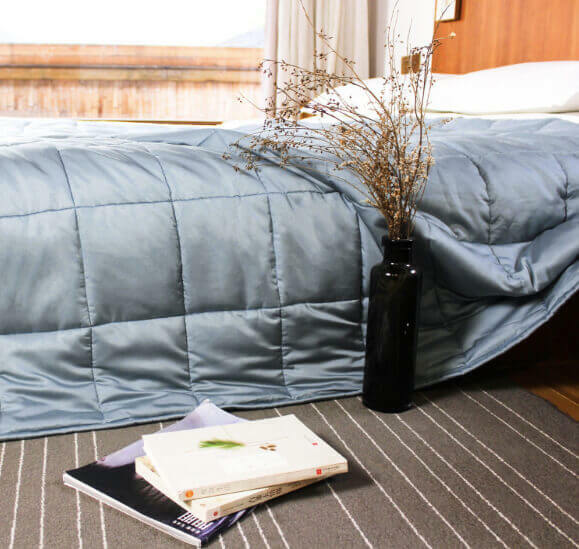 A weighted blanket does not have to cover your mattress entirely. If you buy based on the size of your mattress, you could end up with a blanket that’s too heavy for you. It will take you 2-7 days to get familiar with the blanket. Do not mind if it feels too light or too heavy on the first or second night of use. Weighted blankets are not safe for pregnant women and very young children. Seniors should use it with caution because of the weight. 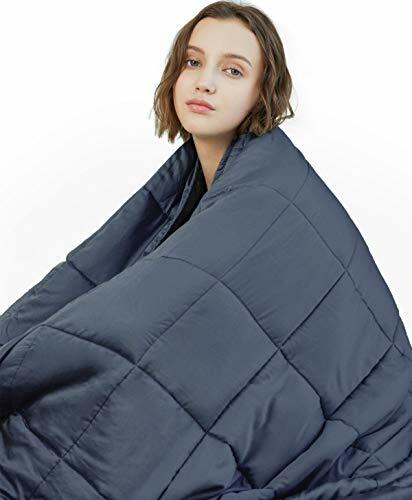 You cannot cover your head a weighted blanket. We hope that you’ve had all your questions answered after reading this in-depth YnM Weighted Blanket review. Do not suffer from sleepless and restless nights ever again when you can get a good quality heavy blanket at such low prices. If your child is struggling with ADHD our autism, you can buy a YnM weighted blanket for your kids as an adjunct to other therapeutic interventions. The results will amaze you. If you have been struggling with low quality sleep and disorders like ADHD, PTSD, insomnia, stress, anxiety and other nervous disorders, we bet, you will surely get some relief by using the all new weighted blanket by YnM. The brand offers great quality blanket at an affordable price so that everyone could benefit from it. There is a different range for both kids and adults. Use the appropiate weight and sizing chart to make the right choice.